Rosh Hashanah is September 9-10, and our holiday menu is full of delicious offerings, including several varieties of cakes, mousses, fruit tarts, rugelach, honey cakes, challah and so much more. You can even order ahead to have your selection — including custom cakes — waiting for you to pick up just in time for your special celebration. And, if you mention seeing this here, on our web site, Facebook or on Twitter, we’ll give you 10% off! Just stop by or call us at (914) 472-0702. 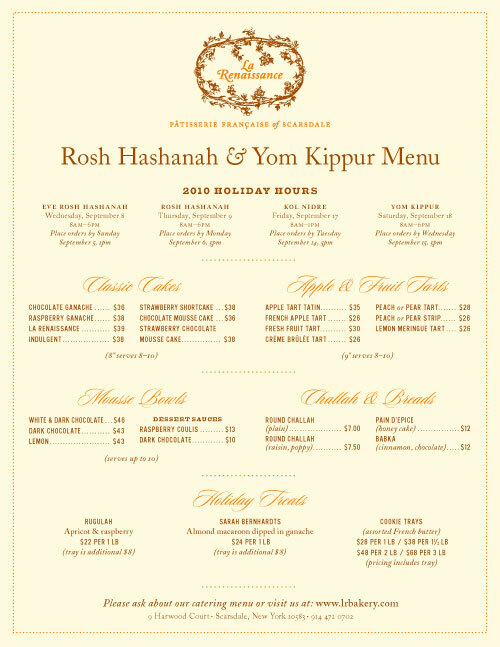 Download a copy of our Rosh Hashanah menu here.